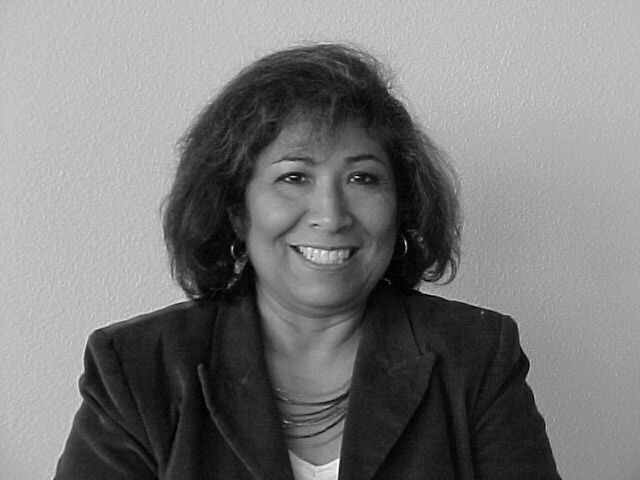 Patricia Santos Marcantonio was born in Pueblo, Colorado, and earned a Bachelor of Science degree with distinction in mass communications from the University of Southern Colorado. She has taken upper level courses through Idaho State University, and has taught continuing education creative writing courses. She is an award-winning journalist, and has won honors for her short stories and screenplays. Her children’s book, “Red Ridin’ in the Hood and Other Cuentos,” (Farrar, Straus and Giroux) has earned several honors including, 2007 Anne Izard Storyteller’s Choice Award; Commended Title – Americas Award for Children’s and Young Adult Literature, 2005; Starred review–American Library Association; Best Collections to Share–2005 Wilde Awards and recommendations from Bulletin of the Center for Children’s Books, Horn Book, Kirkus Reviews and Publishers Weekly. “Red Ridin’ In The Hood: And Other Cuentos” was published in May 2005 by Farrar, Straus and Giroux, New York. “On Holy Ground, The History, Art and Faith of St. Edward the Confessor Roman Catholic Church” was self published in January 2004. First Place in 928’s Pacific Northwest Screenwriters’ contest 2007 in the comedy division, “Down At Cactus Lanes”. Hello. My daughter is doing a report on Patricia Santos Marcantionio for school. We are having a hard time finding her date of birth on the internet. Is there any way someone can supply us with this information? Pat is out of town until October 16. I’ve left a message for her, and if she gets back with me, I’ll let you know. I am honored to be the topic of her report. I am out of town, but please let me know if you need anymore information. My daughter has a reading project that is focusing on Hispanic Heritage month or more specifically Hispanic Authors. She has the privilege of researching you! That being said, there is very little information on the internet pertaining to the specific topics that must be covered. Is it possible for you to send an e-mail address that she could ask you questions such as: Did you enjoy school? Favorite authors as a child, interesting facts about your life, etc. She was just assigned this project and it took many hours of digging to find this information. Any help would be greatly appreciated! Her project is due October 15th. Thank you for your consideration! So sorry that Pat is out of town. If she contacts me, I’ll relay your message. Thanks for taking the time to look us up. I enjoyed school very much. In fact, I loved school. I loved to read — everything from books to comics. Reading was one of the many things that made me want to be a writer. I’ve been writing stories since I was in elementary school. I loved Dr. Suess when I was a kid, and I loved superman comics and an interesting fact was that I wanted to be Lois Lane when I was a kid. My family are great storytellers and that also made me want to be a story teller also. My parents were always encouraging me and in fact, bought me a secondhand typrewriter when I was in Junior High School. I used to tell the stories to my father, who couldn’t read. They were great supporters of me. I also have a reading project focusing on Hispanic Authors. I am having trouble finding some exact information that I need. Could you please tell me where did you grew up? Did these places and culture influence your writing? When you were in the sixth grade did you like or play any sports? I like all sports but my favorite is football and track. Thank you for helping me. I have enjoyed learning about you. sorry for the delay, but I was out of town. I grew up in Pueblo, Colorado, which greatly influences my writing. My family are great storytellers and that made me want to tell stories also. Because I am a Latina, the culture always shows up in my writing. In the sixth grade, I didn’t play any sports, but I was very active. I didn’t have any video games, which is good because my friend and I played outside a lot. I also loved to read and watch old movies on TV. I was somewhat a nerd. My daughter is doing a project on Patricia Santos Marcantonio. what are some of your favorite foods of your culture? I am honored to be the topic of your daughter’s project. I love any Mexican food, but my favorites are tostadas and chicken tacos. Tamales are a close third. If you go to my website, http://www.patriciamarcantonio.wordpress.com, I have a bunch of my family’s favorite recipies. I am reading you Red Ridin in the Hood to my special education class in high school. I am looking for some possible lessons plans to work with the students. Any ideas? There are great activities related to the El Dia del los Muertos (day of the dead). You can have kids make skeleton masks out of papier mache and then paint them, as well as make Pan of the dead (bread of the dead). I also love lessons that get students to write, so maybe they could write their own version of a famous fairy tale. These stories would also be fun to act out in a mini-play. Pat, soon it will be 30 years since the Pam Allen story hit the Magic Valley. She was the first pediatric liver transplant patient in Idaho. You were there from the very beginning. Why not write her story? I do remember that very well. Although it would make a great story, unfortunately time does not allow me to pursue it. thanks again for thinking of me. With self-publishing, you might think of doing the story yourself.